Our latest call entails some very disappointing news, as the Patriot Act has been extended for another year without reforming the three integrally needed changes. It is difficult to see a sliver of positivity from this, but it exists in the mere fact that it is only a year extension, and the need for our continued effort within this fight continues. We have been working on our mission statement on the wiki, and there are discussion threads at the bottom of the page going over the changes where you can let us know what you think! The regular meetings we are holding are cited as being absolutely necessary for holding our diversified coalition together, however, we need to be more strategic about how we can continue them (as well as the improving nature they have exemplified) as we move forward. Specifically, we are asking for others to step up and help promote the event through our various channels (including email lists, Facebook events and messages, Twitter, etc.). We’re working on a system to organize and promote these meetings in a more collaborative fashion, but if you are willing to help out, please let us know as we are actively recruiting participants to take small pieces of the larger effort needed to coordinate these calls and online chats! As the 2010 and 2012 elections near, we see a greater opportunity to leverage Organizing for America (previously My.BarackObama.com), or whatever social networking service utilized to coordinate Obama supporters, in our efforts to make real our hopes for change. We are discussing holding bigger events, and are contemplating a few different time frames. Jim likes the concept of an April event to coincide with “Patriot Day”, a variety of members would like to hold an event on 9/11 (which would coincide with Tea Party events), and Ben Masel and Jon both like the idea of an October 12 event on the anniversary of the Patriot Act. Ben also made the point that, considering the limited impact we can make on the Patriot Act in the meantime, we should broaden our scope, and specifically it may be time to push for a revisit of the wiretap act to add both video surveillance and location tracking. 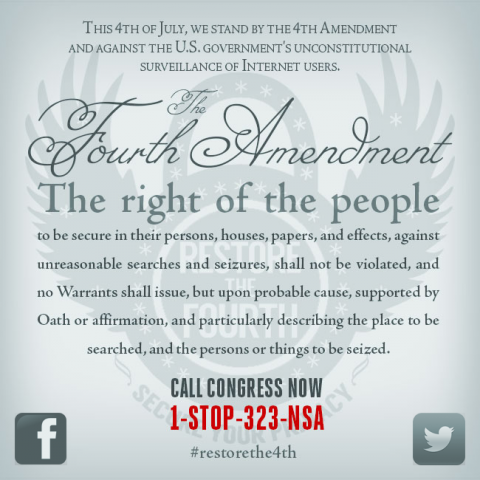 Join us for our latest Patriot Act and FISA meeting this Thursday at 3 pm PST / 6 pm EST. Here is the meeting page, and feel free to make use of the chat room or the comments section of this blog post for pre-meeting preparation or to let us know your thoughts! Check the key takeaways from our last meeting for context or a reminder of where we are currently at, and we hope to see you in the chat on the meeting page and/or on the call! Nobody has any authoritative information regarding the current status of the Patriot Act reauthorization legislation, but indications are that the bill will be attached as a rider to a larger piece of legislation before it would sunset. Assumption is there will be a one year extension. Short term, we are focusing on distributing our Idea for Change in any way we can. The login to Change.org can be difficult, so if possible, make sure to follow up with people who commit to signing to make sure they have done so successfully. Discussed the need for education in regards to this issue, especially to fortify our longer term efforts of aligning ourselves with libertarians willing to fight for civil liberties. BORDC is circulating “best practices” model legislation and talking points to local civil right groups, in order to “let grassroots people do their thing”. Again, thanks to everyone for joining the call and taking part in a particularly active online chat! Yet assertively championing constitutionalism would be shrewd, as well as principled. Hundreds of cities and towns across the country (and a compelling handful of unholy bedfellows among the states) have already rejected the beltway consensus favoring domestic spying. Restoring constitutional rights is thus a political imperative: whichever of the major parties more assertively defends the populist principles at stake stands to siphon the support of significant portions of the other’s base. If neither party engages on that front, what began as the Bush administration’s assault on long-established constitutional principles could become — by virtue of its ratification and entrenchment by a Democratic administration — a seemingly permanent fixture of American politics. The stakes couldn’t be higher, as it is the fundamental nature of our democracy that is at stake! It is why we must all continue to fight for the rule of law, as Buttar is entirely correct that this effort encompasses saving the “very fabric of our society”. Our next organizing call will be this Tuesday, Feb. 16 at 5 pm PST / 8 pm EST. Here is our meeting page, and we couldn’t encourage you enough to use the chat room to comment on our agenda and goals and for general discussion! We’ll be following up on our key takeaways from last week, including our focus on our Change.org Idea for Change, as well as continuing to solidify our short and longer term initiatives. We had another quality call this week, discussing next steps to our long and short term plans. You can read the full transcript here, and please let us know when you can make our next call. Shahid from BORDC relayed a particularly disturbing report that there will be a straight one year reauthorization bill rammed through the congress by embedding it within a jobs bill. We will send out information as we get it, as this would clearly impact both our plans’ short and long term trajectories alike. We are promoting our Change.org idea for Ideas for Change, and you can check the link for details about how you can help based on our successful model from last year. Mark and Jim had a long conversation about establishing our “case statement”, and are focusing their energy on finishing it. We are focusing on more directly connecting ourselves with the grassroots civil libertarians, whether they be from the right or left, with a particular emphasis on veterans through Iraq Veterans Against the War. Our coalition is made up of people who privilege grassroots activism, which is why we are such fans of BORDC’s local ordinances initiatives. The key is coming up with local events that can be used as a vehicle to draw energy together, which we could presumably tie into our extensive outreach efforts as well. The latest legislative news may be somber, but we will certainly be keeping up the fight! This debate must not be stifled, especially since it is one of the very few in which people all across the aisle agree, and is indicative of so much more relating to the core transpartisan identities we share as Americans. Ideas for Change 2010: how you can help! Ideas for Change in America is a crowd-sourcing competition that empowers citizens to identify and build momentum around the most innovative ideas for addressing challenges our country faces. The 10 most popular ideas will be presented at an event in Washington, DC to relevant members of the Obama Administration, and Change.org will subsequently mobilize its full community to support a series of grassroots campaigns to turn each idea into reality. Thomas Nephew’s We’re Number 5! We’re Number 5! and Time to celebrate! recount Get FISA Right’s excellent performance in last year’s competition. Yay us! We also wound up with some great new allies, including Democrats.com and the Dream Activists. Last year we got 2171 votes in the first round, and change.org has grown since then so we should probably be shooting for at least 2500. How to get there from here? Co-promoting with BORDC is a no-brainer first step. What else? detailed instructions on how to sign up to change.org. this was a really challenging task for a lot of people last year, so good instructions probably make a 10% difference. Yeah, we should try to do all of that. Is there anybody who can take the lead on various topics — e.g., outreach to Bob Fertik at Democrats.com,or approaching the change.org Criminal Justics blog? If so, please let us know in today’s call or in the comments. And what else should we be doing? You are currently browsing the Get FISA Right blog archives for February, 2010.